During the show I talked about Yiannis Poulopoulos and Poly Panou. Here is a link to a great page about Rebetika music that mentions her. Below is a video of Yiannis Poulopoulos performing "Hlie mou ourane." We also heard music from Dionissis Savopoulos album "Long live the Greek song," a TV series that was broadcast from From October 1986 till June 1987. The album was released on December 1987. Comments and requests can be sent to greekmusic@gmail.com or you can post here. Also you can take part in the poll to the right. Have a great week. 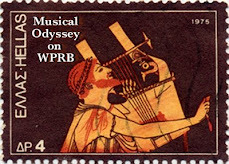 The WPRB online playlist system is down but you can view the playlist for today's show here. Today I spoke about and played music by the great Rebetika singer Giorgos Katsaros. There do not seem to be any YouTube videos of his music so instead I am posting parts 1 & 2 of the BBC Documentary on Rebetika which is hosted by Anthony Quinn. Enjoy. 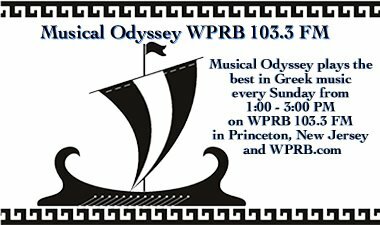 Musical Odyssey will not be on the air next Sunday, I will be taking a short break. In the meantime requests and comments are welcome at greekmusic@gmail.com or you can leave a message on the blog. See you in two weeks!